1a. Read through the Remittance Service Terms and Tick “Applicant agrees to be bound by the Remittance Service Terms” to accept the terms and conditions before proceeding on the application. 1b. 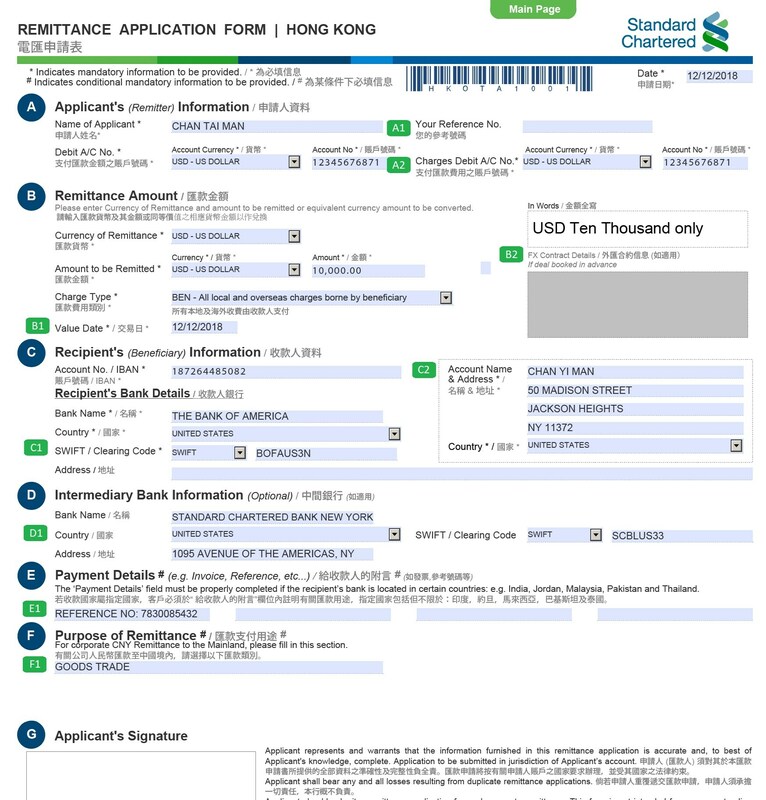 Click “Remittance Application Form”. (A1) Your Reference No. - This field is optional. You can input any remarks in this field for your own reference. (A2) Charges Debit A/C No. - The account and currency where all charges (including service fee, telex charges, corresponding bank charges and other additional fee applicable to the outward remittance) are to be deducted. Please ensure there is sufficient fund for debiting the fee in order to avoid any delay of processing. (B1) Value Date - Indicate here by when the remittance payment shall be deducted. The Bank will use reasonable endeavours to process applications received by the Bank on or before the next working day. For this purpose, Saturday is not a working day. (B2) FX Contract Details - If a FX contract has already been booked for this transaction, please fill in the respective FX Contract information. If you are individual client, you are not required to fill in this field. (C1) SWIFT / Clearing Code - This is a Bank Identifier Code used in the interbank telecommunication. Please click here to check your SWIFT code. (C2) Account Name & Address - Please provide the full name and address of the beneficiary. Name of beneficiary should be same as the name of the beneficiary account maintained at the recipient’s bank. 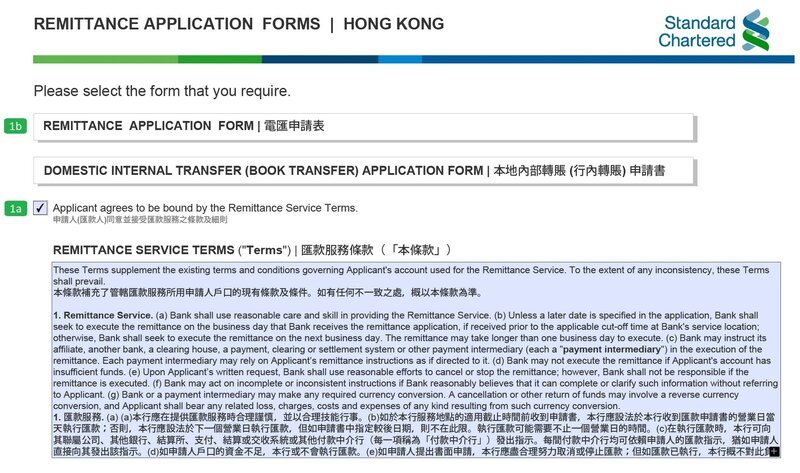 For remittance to the Mainland China, if the account was opened using a Chinese name, the name of beneficiary is required to be provided in Chinese. (D1) If you wish to have the outward remittance routed through a specific intermediary bank, please provide details in this section. Otherwise you can leave this field blank. (E1) This field is conditional mandatory. For payment to certain countries, including but not limited to India, Jordan, Malaysia, Pakistan and Thailand, please provide the payment purpose here. (F1) This field is conditional mandatory. For corporate CNY remittance to Mainland China, please provide the payment purpose here. If you are individual client, you are not required to fill in this field. Step 3 Print and sign on the form, then submit the form to any of our branches. You can also save the completed form for future use. Print the form and sign on the Applicant’s Signature field and submit to any branches nearby. Please click here for the location of our branches. Save the form in your computer so that you can retrieve it as a template of recurring payments in the future.